GLIDR is built with teamwork in mind. 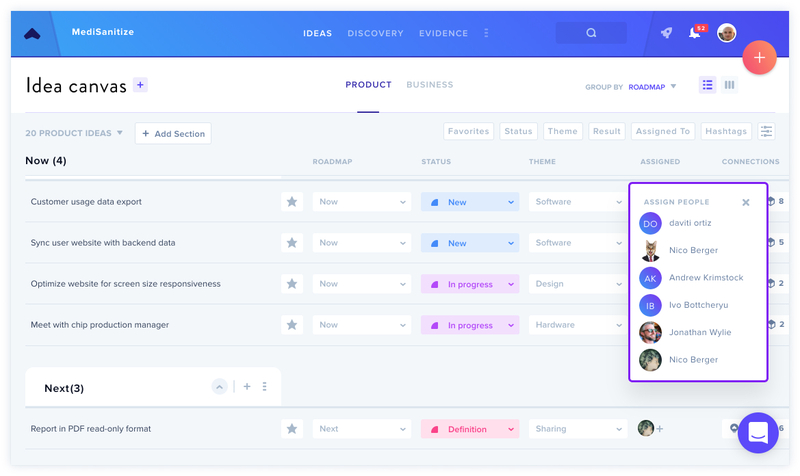 The ability to assign Ideas on your Product Canvas allows you to bring in your teammates to work collaboratively at Idea level. In addition to @mentioning your teammates, you can assign an Idea to yourself, another user, or a number of others. It's easy to quickly assign multiple Ideas in List View by clicking on the + button in the Assigned column. This also allows you to view at a glance who's working on a particular Idea. You can also assign to a teammate while working on an Idea by finding the Assign dropdown next to the Roadmap, Status and Theme dropdowns. Here, you can add or remove team members from the Idea. NOTE: even if teammates aren't added to an Idea, the Idea remains visible and open for comments to them. Find out more about connecting Ideas here.